Go to BUSINESS -> ACCOUNTS RECEIVABLE -> PROCESSING. The above form appears & shows when the past monthly processing has been done. To run monthly billing, press the PROCESS button. A dialog box will appear warning about the process, press OK. The next confirmation will ask if you wish to proceed. Answer YES. The next confirmation reminds the user of the last time that monthly Accounts Receivable was run, and if it should be done now. Since the monthly billing is based on a 30-day interest period, it will caution the user from running this process more frequently than monthly. This time base can be easily changed, but creates a standard for charging interest (additional revenue) for open accounts. NOTE: When charging interest, it is necessary to designate the monthly interest rate in the System Setup. Go to UTILITIES -> SYSTEM -> SETUP, then go to Tab V to specify the interest rate. After answering YES, the system will process all accounts. Any account that has a balance will have an interest charge added for any balance that is 30 days or older. It will also document in their account that a statement was generated on the date processing was done. 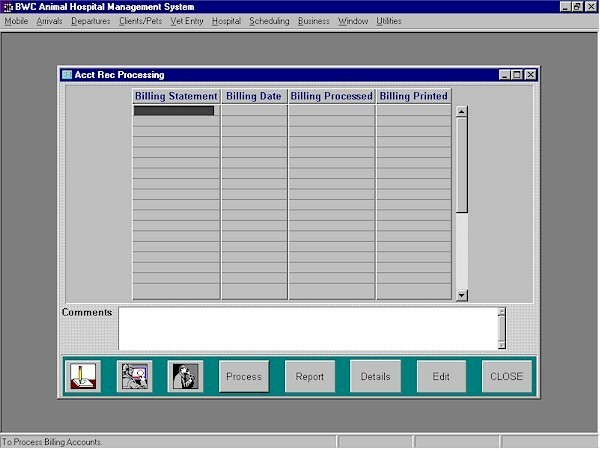 After completion, it will prompt the user to print the billing letters, by pressing the REPORT button. Press the REPORT button to print the billing letters. It will prompt the user that Small Animal billing letters will print first. The report will then be previewed, showing the first billing letter. On the menu, go to REPORT -> PRINT, then select the print range. Continue until the letters are printed. Go to REPORT -> CLOSE to complete the Small Animal billing letters. The user will then be prompted to prepare for Large Animal billing letters. The report will then be previewed, showing the first billing letter. On the menu, go to REPORT -> PRINT, then select the range to print. Continue until the letters are printed. Go to REPORT -> CLOSE to complete the Large Animal billing letters. The DETAIL button gives the user easy access to the AR Data Entry to review or confirm account balances. Press the CLOSE button to close the AR Processing Form.